Directed by Mr. Adam Wallace and Mrs. Joan Judd, the Children’s Choir gives students the opportunity to use their voices in praise and adoration to God. The choir performs at Sunday Mass as well as the Mass on Fridays when the whole school is in attendance. The choir provides a wonderful and youthful sound to the Mass and also displays the student’s individual ability to lead and sing solo. Singing in this ensemble has proven to be a highly spiritually rewarding experience for the students. 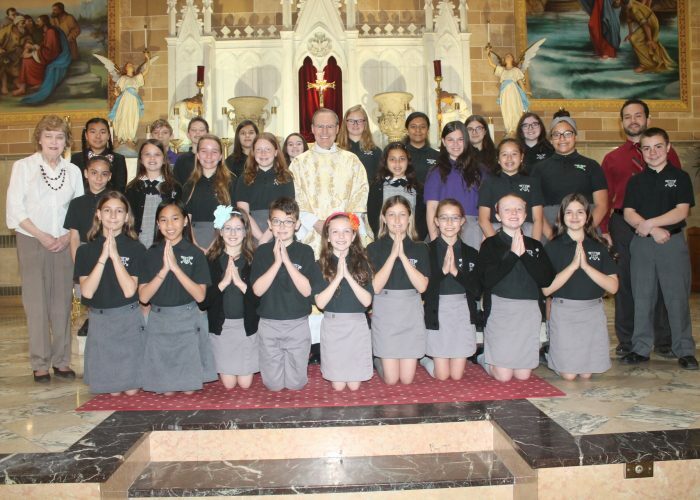 Membership in the St. Peter School Children’s Choir is open to students in Grades 4-8. Weekly practices are conducted by Mr. Wallace and Mrs. Judd every Thursday after school in preparation for singing at the 9:00 AM liturgy on Friday and Sunday mornings. The choir also sings for special occasions, such as, the Christmas Eve Children’s Liturgy, Forty Hours and First Holy Communion. Every year the choir accepts the invitation to sing at Merchantville’s Christmas Tree Lighting Ceremony.